Wow, psychedelic space from Portugal! Reading Polly's review of Saturnia's first CD (also reviewed this issue), it seems that Luis Simoes has gone through a number of partners. 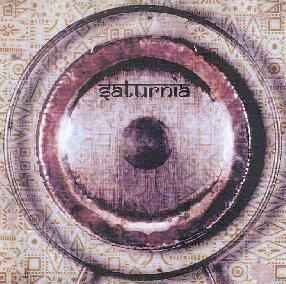 On Saturnia's second release, Simoes plays electric and acoustic guitars, sitar, lap steel, theremin, and gong, and newcomer Franscisco Rebelo plays organ, synthesizer, and gong. Lots of instruments, and believe me these guys USE them, sounding more like a full band than a duo. The music is firmly in the psychedelic realm, though lots of fun spacey synths are prominent, Dub influences, and a heavy classic progressive rock presence. Quite a combination, and this is what gives Saturnia a sound that's a little different than what I typically hear these days. The CD opens with my favorite track on the disc, "Chrysalis", which consists of Dubby, tribal percussion, freaky bleeping space synths, organ, a wave of drone, trippy sitar, floating vocals, and other magical sounds that make this a psychedelic feast for the mind. The mixture of Eastern ragas and tripped out electronic space create an atmosphere that is both absorbing and fun. "Bliss" includes similar percussion, but the guitars, keyboards, and the song itself reminds me of Pink Floyd circa Dark Side Of The Moon. Yet Saturnia is far more ethereal and has a paisley colored feel that the Floyd had lost by the time the monumental Moon was recorded. The bluesy guitar on "Still Life" makes it a little different, but there are also more prominent Dub efx, space synths, and a simple but lovely flute melody. "Still Life" segues smoothly into "Trick Of The Light", as the same flute melody plays to chirping birds and a waterfall. But soon an eerie ooh-wee-ooh synth crashes the pastoral party making for a mucho freaky combination. We're lounging in the forest while the aliens hover overhead. The space craziness builds while the birds hang in there and the flute refuses to let its meditative melody be overtaken. The chirping birds then lead us into the 11 minute track "Ozimuth/Menadel". As the birds fade away a deep tribal drum, almost like a timpani, sets a beat for a dark Phantom of the Opera organ, more Dubby beats, and vocals that recall Syd Barrett. About half way through the track the music evolves into a similar theme that opened "A Trick Of The Light", but with more of a 70s classic prog rock sound, though the music retains the Dub and spaced out psychedelic feel. It's hard to describe and that's what makes the music so cool. Wonderful keyboards! Two other tracks that are a little different are "Organa" and "The Glitter Odd". "Organa" is a standout track, sounding like a psychedelic prog rock take on James Bond music... or maybe Pink Panther would be more accurate. A groooovy 60s sound that reminds me of so many great film soundtracks. And love that wah'd trippy guitar. And "The Glitter Odd" is an intense ambient electronic space piece with deep drones and an experimental avant-garde feel. In summary, Saturnia rank high on the psychedelic space meter. There's so much happening on this disc that repeated listens continue to reveal something new. And Saturnia have set themselves a little apart from the rest by mixing varied influences into a cosmically cohesive whole. I hope to hear more from them. For more information you can visit the Saturnia web site at: http://www.fortunecity.com/athena/motherhood/208/. The Glitter Odd is available from Cranium Music. You can visit their web site at: http://www.cranium.co.nz. Contact via snail mail c/o Saturnia Av. Dom Pedro V No 39 1Esq, 2795 - 152 Linda-a-Velha, Portugal.